Sanbot MAX, 137 cm high, is capable of independently mapping a room, avoiding objects and people, translating, answering guests' questions, delivering items, and attaching third party accessories. The robot uses a 3D camera and high-speed vision SLAM technology to build and navigate a map. The top speed of Sanbot Max is 5 meters per second. Using 3D laser vision technology, multiple infrared and ultrasonic obstacle sensors, Sanbot Max can easily move in any complex environment (inside). The robot can operate for 18 hours on a battery. 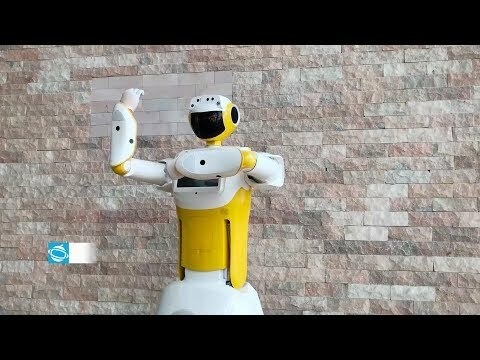 Sanbot MAX robot, a multifunctional servicerobot is capable of independently mapping a room, avoiding objects and people, translating, answering guests' questions, delivering items, and attaching third party accessories. The robot supports several languages and specific settings can be made per environment. This robot has around six microphones that can pick up a 5 meter voice command in any direction (360 degrees), even in noisy environments. Sanbot MAX features multiple HD and 3D cameras for highly accurate visual positioning as well as advanced face recognition and fast object recognition. Tools that can support effective feedback. Elements that support transport (logistics) or presentation, such as a large screen, can be linked to the robot.